The Material palette contains a library of materials to choose from. Each material contains modifiers which cause it to interact with light in a unique way. Unlike some other palettes, materials are not added to, or removed from this palette. They can be replaced with materials loaded from disk files. The large material thumbnail acts as a picker — click within this window and drag to the canvas to select the material at that point. 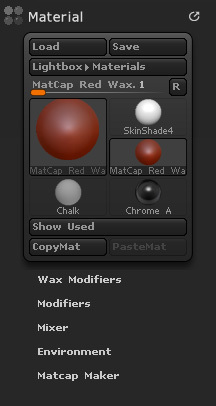 In addition, ZBrush remembers all materials used in a document; they’re saved with the document, whether customized or not. Editing or loading a material here also changes any painted elements on the canvas which use the corresponding material. The Load Material button replaces the selected material with a saved one. The Save Material button saves the selected material to a disk file. Use the Material Item Info slider to select any material in this palette by number. Press the R (Restore Configuration) button when a large number of selected items cause this palette to grow too large. All but a few items will be hidden; they can be retrieved by pressing the large thumbnail and selecting them from the popup palette. The large Material thumbnail displays the current selection. Click the thumbnail to choose from a popup menu of available Materials. In addition, this thumbnail serves as a picker. Click inside this thumbnail and drag to the canvas to pick the material at that point. The Show Used button examines all materials used in the document, and displays their corresponding icons in this palette. Allows you to copy one material and paste it in to replace another. You can do this if you want to change the replaced material wherever that material is used in the scene. It’s also useful for getting a copy of a starting material, so you can modify the copy but not affect the original.